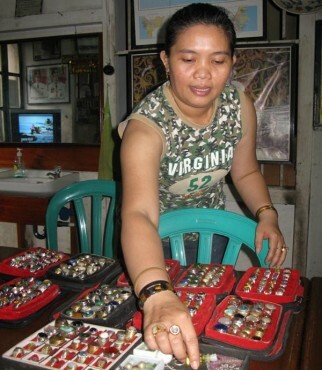 Lusiana (38), a woman from Pavilion proved to have a unique hobby of collecting hundreds of stones that either precious stones or gems, agate and fossils. Lakoni hobby he took care of business while eating his house on Jl Mr. Love No. 46 Pontianak. Hobby is apparently down from his father. Since 1960, Lusi familiar greeting used to seeing his father bought the stones from vendors who come from different regions. “As a child I was confused, out of nowhere are people coming to the house to sell the stones to the Father. Now I can get a collection of the stones themselves, some even from India,” said Lusi Tribune found at his place of business, Monday (02/04/2012). Over time, Lusi participate stunned at the value of the charm, exotic colors and precious stones of this nature. Around 2000 he began to collect one by one these precious stones. Not feel, the collection has now reached 700 kinds of precious stones. These stones he got from various areas such as Kapuas Hulu, Ketapang and Banten. “Of the hundreds of stones, zambrud a collection of the most expensive. I bought about USD 5 million. Anything else shaped pendant made of stone birds of paradise. In my hands alone is around 40 years. Yet in the hands of pertamannya. Probably already tens of years old, “said Lusi. Other precious stones owned by Lusi the ruby, emerald, blue sapphire, amethyst, Padar iron, topaz, ruby, opal moon, king sapphire, cake ai, badar moss, Zabar jat, cat eyes, post-pound range in price between $ 1 million to $ 5 million. “To all, money that has come out about $ 500 million and above.’s Not a problem at current prices see, but the meaning, beauty and artistic value. Fact, if any of the schools and understand the rock, even hundreds of millions would have dikeluarhakan,” he said. According to him, there is a separate value of the stone owned. Dikarakannya, some people believe the stone type ruby ruby or make the person wearing it more authoritative. The man was in baluti compassion. “All the stones are of this nature and have a life to live. Regarding mystical value, depending on the person, believe it or not,” he said.